Paris, France - Independent developer Smartphone Pliable is proud to announce the release and immediate availability of iPliable 1.0, their entertaining new arcade game for iPhone, iPad, iPod touch, and Android devices. 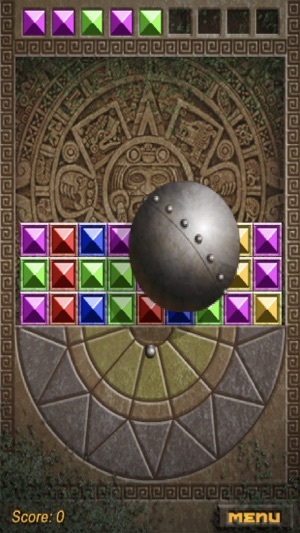 Players must aim and release their magnetic ball, in an effort to clear the board of the dazzling gems before the board fills to the top. "I always loved the Mac game Snap but couldn't find anything like it for the iOS or Android platforms," shares developer Patrice Krysztofiak. "So, I decide to create the game on both of those platforms, for my own and other players' enjoyment. I am so pleased with the end result, and find it to be an enjoyable challenge, even though I am the developer that created it!" iPliable is one of those games that players can enjoy for just a few minutes, such as while they're waiting at the coffee shop for their morning Java or waiting for an appointment. However, the game can also be enjoyed for hours at a time, delivering game-playing goodness to even the most boring of evenings. The game is always ready in the player's pocket, at the ready to divert them for a few minutes or for hours at the time. Unlike the flat, 2-dimensional gameplay of games such as Tetris and Columns, iPliable brings a third-dimension of challenge to the gameplay. Players can't simply aim and fire at random but must instead carefully but quickly determine where the next shot will go, in an effort to clear the most gems possible with a single shot of the metallic ball. While players must strategically plan their next shot, they can't take too long, or the gems will fill the board all the way to the top and the game will start over from scratch. Every game is a new challenge, requiring a fresh strategy each time. "I can't wait to find out what iPhone owners are going to think of iPliable," continues Patrice. "I believe they'll embrace the challenge, playing round after round, looking to bust just one more screenful of gems before the challenge ends. I'm proud to offer iPliable as a 100% free game, with no advertisements or other diversions to distract players from the action." Headquartered in Paris, France, Smartphone Pliable is a privately funded Corporation founded by Patrice Krysztofiak. The company has longtime experience in the development of apps for the iOS platform. All Material and Software (C) Copyright 2019 Smartphone Pliable. All Rights Reserved. Apple, the Apple logo, iPhone, iPod and iPad are registered trademarks of Apple Inc. in the U.S. and/or other countries. Other trademarks and registered trademarks may be the property of their respective owners.